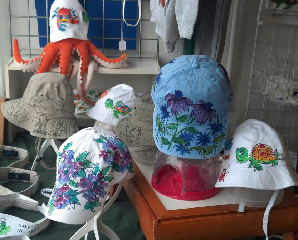 This entry was posted in Acrylics, Decorated Apparel, Hand Painted Clothing, Painting, Wearable Art, Willy Nilly and tagged baby hats, baseball caps, floral, flowers, hand painted by Deborah. Bookmark the permalink. ← Previous Previous post: NO Freakin’ Fracking WAY, puh-leeeease! !